Friday, the northern Syria city of Manbij was liberated from ISIS, and residents celebrated by doing things that the militant group had forbidden. They have poured into the streets enjoying basic rights they had been denied for two years, including shaving off their beards and smoking. US-backed Kurdish and Arab fighters fought 73 days to drive IS out of Manbij, close to the Turkish border. About 2,000 civilians being used as human shields were also freed. Reuters news agency spoke to a resident of Manbij who described a spot where people were beheaded. “For anything or using the excuse that he did not believe [in God], they put him and cut his head off. “It is all injustice,” he said. “I feel joy and [it is like a] dream I am dreaming. I cannot believe it, I cannot believe it. Things I saw no one saw,” a woman said screaming and fainting, according to Reuters. Under the Islamic State, women were forced to cover their faces. But on Friday, some of them were photographed with lifted veils. One woman set fire to a niqab, a veil that covers all of a woman’s face except the area around her eyes. In this image from May, Cardinal Jean-Louis Tauran, left is seen Sheik Ahmad el-Tayeb, grand imam of al-Azhar mosque and university, and Archbishop Georg Gaenswein at the Vatican. The French cardinal said terrorists want to make peace-loving Christians and Muslims believe that it is impossible for them to live side by side; it is up to Christians and Muslims to prove them wrong. Terrorists want to make peace-loving Christians and Muslims believe that it is impossible for them to live side by side; it is up to Christians and Muslims to prove them wrong, said French Cardinal Jean-Louis Tauran. The cardinal, president of the Pontifical Council for Interreligious Dialogue, said he was in France 26 July when 85-year-old Father Jacques Hamel was brutally murdered in Saint-Etienne-du-Rouvray near Rouen. The Islamic State group later claimed responsibility for the murder. As now-retired Pope Benedict XVI taught, he said, dialogue deepens only when both dialogue partners know and practice their own faith and are willing to try to explain it to the other. Christians and Muslims, he wrote, “can — rather, we must — work together and promote religious instruction,” especially in societies that appear to be trying to drive religious faith to the margins of social life. Pope Francis sits with refugee children from Syria at the Vatican on 11 August. Mar Varkey Cardinal Vithayathil was a leading force in the Syro-Malabar Catholic Church in India. Mar Varkey Cardinal Vithayathil of the Syro-Malabar Catholic Church was a good friend of and advocate for CNEWA in India until his death in 2011. In the true spirit of Christ, a Syro-Malabar army of priests, religious and lay persons offer spiritual sustenance, moral education and social service programs to those in need. Prior to his appointment as the Major Archbishop of the Syro-Malabar Catholic Church, Mar Varkey Vithayathil, C.S.s.R., worked in various apostolates for more than 30 years. From his residence in Ernakulam, Kerala, this soft-spoken man explains that, after Ukraine’s Greek Catholic Church, the Syro-Malabar is the second largest of the 22 Eastern Catholic churches; its influence is great. ...Centered in Ernakulam, the Syro-Malabar Catholic Church reaches out to her country’ poor through an extensive social services network. Many of these programs receive direct support from CNEWA. ...Micro-credit programs encourage poor families to save their money; small loans offer women the opportunity to start their own businesses. A house-building program uses direct grants or loans to allow families to obtain basic housing. Health programs, latrine construction, safe drinking water, garbage recycling, biogas generators — which generate cooking gas from farm animal manure — smokeless stoves, organic farming and composting, AIDS awareness, vocational skills training, homes for the aged, orphanages and emergency disaster relief are just some of the many programs and services offered. A driving force behind all of this for many years was Mar Varkey Cardinal Vithayathil. Born in Kerala in 1927, he joined the Redemptorists and was ordained a priest in 1954. After studying canon law in Rome, he returned to India to teach. In, 1996 he became the apostolic administrator of the Syro-Malabar Major Archiepiscopal Church and of the Archeparchy of Ernakulam-Angamaly. In 1997, he was named a major archbishop. In 2001, the pope elevated him to the College of Cardinals. CNEWA had the opportunity to welcome Mar Varkey Vithayathil, to our New York office in 1998, shortly before he was named a Major Archbishop. In 2001, he became a cardinal. It was during Cardinal Varkey Vithayathil’s tenure that CNEWA opened its regional office for India in Ernakulam in 2003. Cardinal Vithayathil extended whole-hearted support to our programs and projects. “Seventy-three percent of the priests and religious working in the Latin dioceses in northern India hail from the Syro-Malabar Catholic Church,” Mar Varkey said in his interview in 2000. A large number of Syro-Malabar clergy work in Latin missions throughout India and the world — and the cardinal worked zealously to carry out the Church's ministry wherever possible. In addition to his work as an archbishop, Mar Varkey was a member of the Congregation for the Eastern Churches, of the Pontifical Council for Legislative Texts and of the Pontifical Council for the Promotion of Christian Unity. As CNEWA marks 90 years of service to the world, we fondly remember the heroic support of our friends and partners in India, especially Mar Varkey Cardinal Vithayathil, whose generous spirit still inspires us. Arpine Ghazaryan cuts her son’s hair. She lives with her two boys in Gyumri, Armenia — just one of many families in the country who are now fatherless. 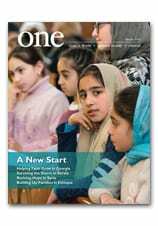 Discover why, and what is being done to help them, in Armenia’s Children, Left Behind in the Summer edition of ONE. An injured boy stands amid rubble outside his home after airstrikes in Aleppo, Syria. Iraqi Christians appear divided about whether they will be able to return home after Islamic State militants are flushed out of the battle-scarred Ninevah Plains region. They say their safety must be guaranteed at all costs. Housed in an unfinished concrete building, Yousif and other displaced people live in containers that take the place of homes lost to the Islamic State. He said his home region would be a different place from what he remembers due to the dispersal of friends and family abroad because of the long wait to rid the area of the Islamist extremists. “About 60 percent of my friends are now living in exile, whether in neighboring countries or Europe. My mother, father and two sisters are now in Lebanon. I have a brother in Jordan. My uncle is in the United States. Only another brother and I are still in Iraq,” he said. It was unclear whether Yousif’s family would regather in Iraq following the liberation. Um Fadi, a 37-year-old Chaldean Catholic mother, also is concerned about safety. She and her family of six live in Ashti II. “I swear, I never saw something like this except in a horror film. But I actually witnessed people being killed and saw dead bodies with my own eyes,” she said of her escape from the Islamic State’s assault on her village of Qaraqosh two years ago. “Of course, we are frightened to return. What are we going back to? The houses and churches have been bombed. My children, particularly my youngest son, is very frightened about the idea of returning there,” Um Fadi told Catholic News Service. Other Christians like, Saif Haney, told CNS they will never go back home because they heard that Islamic State militants used their family houses as execution dens. Some Iraqi Christian political leaders are calling for the inclusion of armed Christian militias to participate in the liberation of Mosul and the Ninevah Plains, their ancestral homeland, alongside U.S.-led coalition forces, Iraqi troops and Kurdish fighters. Although that may not happen, Christian political leaders such as Yousif Yaqoob Matti want to see Christian defense forces built up to protect Mosul and the Ninevah Plains after their liberation. They said this is necessary because although many Christians would prefer to have an international force, such as U.N. peacekeepers in the area, this is unlikely to happen. Bahman Maalizadeh of the North Carolina-based Norooz Foundation has traveled to Mosul’s frontline villages ahead of the offensive. His and other nongovernmental organizations have provided badly needed food and medicine to displaced Christians and Yezidis. A man who identified himself only as John, a Syriac Catholic from Hamdaniyya, is Um Fadi’s neighbor in Ashti II camp. Although he and his family are desperate to forget the past and to leave Iraq, that might not be possible. He and his family have already been displaced already twice: They had to flee the capital, Baghdad, for safety to Hamdaniyya and then escape to Ain Kawa following the Islamic State takeover of their area. Selim Sayegh served for many years as the Latin patriarchal vicar of Jordan. Selim Sayegh was an auxiliary bishop of Jerusalem, serving for many years as the Latin patriarchal vicar of Jordan, based in Amman. He worked closely with CNEWA, particularly helping the poor and marginalized, most notably refugees and children. Jordan is now passing through a difficult political and economic stage and we pray to God that we can overcome it in peace, and that we always proceed toward the best with clear thinking, wisdom and responsibility. We all know that achieving the best is not done by one push on the button or remote control, but it needs a strong will, time, planning, work and lots of sacrifices. ...The state does not consider the Iraqi migrants in Jordan as migrants, but as guests. Lawfully, they are not under the migrant’s laws and regulations. They are living in peace and enjoy security and privileges that cost the Jordanian government millions yearly. The government, for example, supports “bread for all” Jordanians and non-Jordanians. A minority from the Iraqi migrants is rich and does not need any support. The church helps them in any way possible, especially through the Caritas Jordan and CNEWA/Pontifical Mission. He also touched on a project close to his heart, the Our Lady of Peace Center in Amman, a haven for children who are handicapped or developmentally disabled. ONE: One of your most important initiatives has been Our Lady of Peace Center in Amman. Where did you get that idea? Bishop Selim Sayegh: Our Lady of Peace Center addressed two prominent needs of the Church in Jordan. The first need is the service of the handicapped. The Latin Patriarchate of Jerusalem established its schools and charitable institutions in Jordan in the middle of 19th century, but it has no institution or activity to look after the handicapped in Jordan. They are the poorest of the poor and most in need of services and help. I saw that the church should have a place to perform her duty and witness to Christian charity in this field. Selim Sayegh’s heroic dedication to the suffering and marginalized in Jordan has had an enduring impact — and we have no doubt his own “good works” will “give glory” for years to come. Below is a video of the bishop, whom we also profiled in 2009 during the Year for Priests.